These 15 stamps are wonderfully versatile. 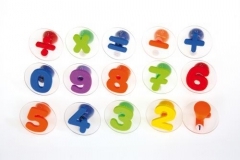 Whether used creatively or for the first foundations of Maths, these stamps including handles are ideal for small hands. This set contains numbers 0 to 9 and 5 arithmetic symbols (operations). Made of plastic and each stamp contains a handle. Recommended age group: 3 to 99 years old. For stamping we recommend the " Giant Inkpad" (item 81533).